Welcome to Marrakesh, imperial gateway to Morocco and northern Africa! This month, we peek over the ramparts of Marrakesh to investigate its culture and cuisine. 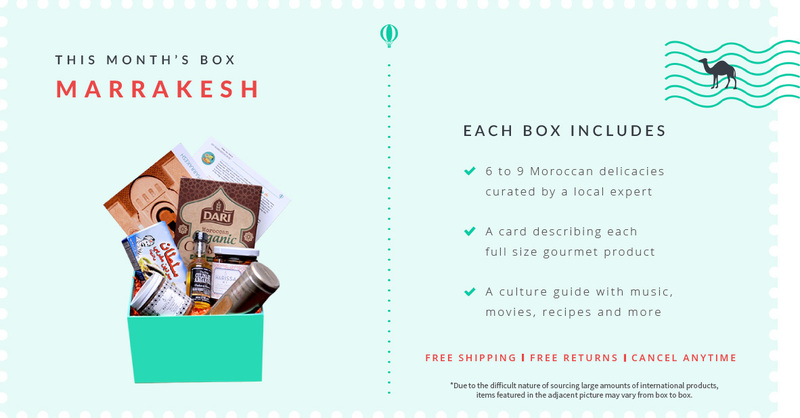 Get lost in the streets of Marrakesh with this box. As you enjoy delectable treats, imagine yourself reclining amidst the lush flora of the Majorelle Gardens, overlooking, one of its glittering lakes. Try the World past the desert dunes to explore this jeweled metropolis -no camel required. Along with the products is a Culture Guide to Marrakesh which includes recipes to create with the contents of your box as well as information on music and Moroccan movies. Also, included is a card describing each full size gourmet product. This savory sauce has a unique combination of olives and lemon confit. 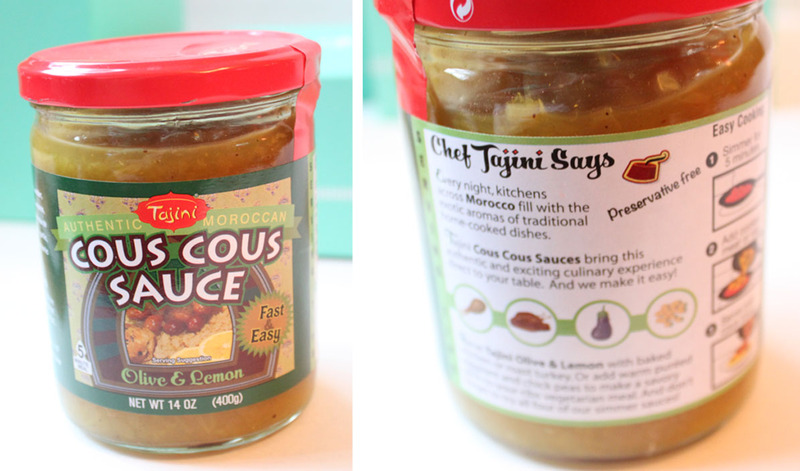 Made from an genuine Moroccan recipe, this sauce can be used to liven up a chicken or vegetable side dish. Tajini sauce will add an authentic flair to any dish. I haven't tried this yet, but the flavor combination sounds so interesting and unique. Full of potassium, fiber, protein, and antioxidants couscous is one of the most nutritious things you can eat. Enjoy in salads, meats, for breakfast, lunch or dinner. 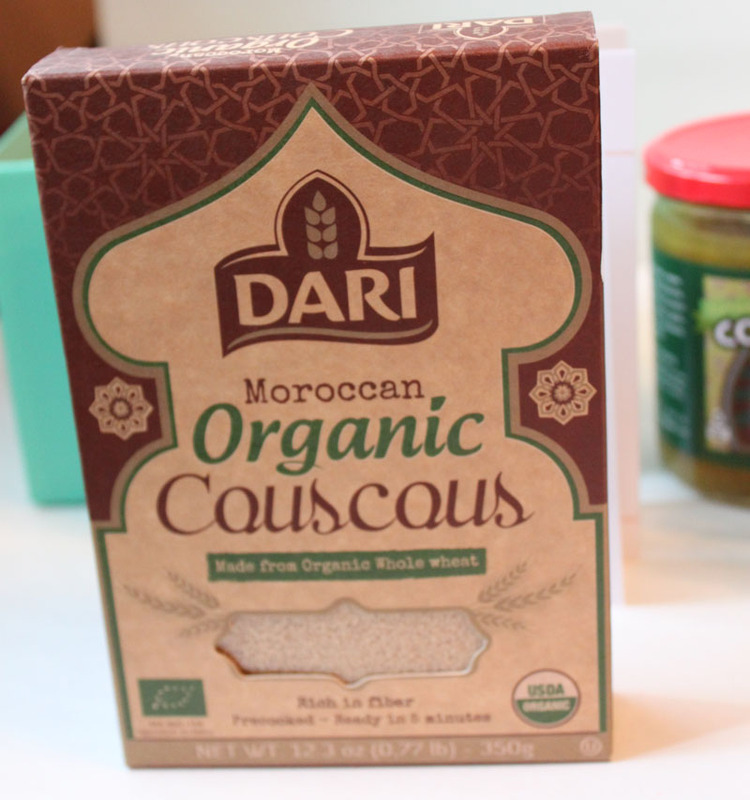 I was excited to get this because I've never actually tried couscous before. I know right? It's so readily available. Looking forward to whipping up a new healthy dish with this. Dip&Scoop’s argan oil is smooth and nutty. Drizzling a little bit over salads, soups, or fish will add depth and complexity without compromising the natural flavors of your dish. Dip some bread in it for a simple and delicious snack. Who knew Argan Oil wasn't just for beauty products? This oil is tasty and nutty as a drizzle over grilled vegetables, salads, or with flat bread. 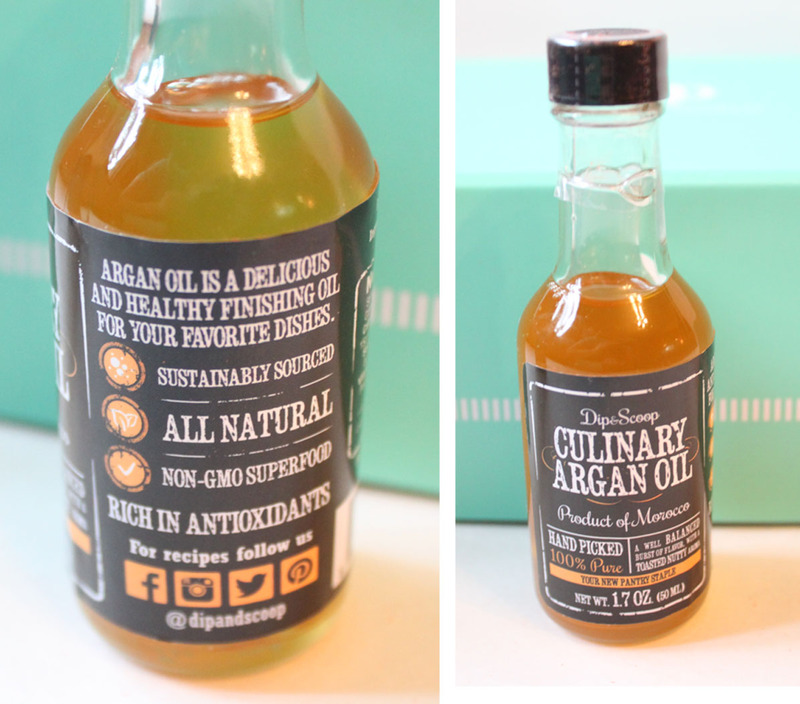 Don't go dipping in to your hair argan oil, this one is made for culinary use. This oil is handmade by Berber women in Southwestern Morocco. Dip&Scoop is able to empower Women by paying them fair wages and providing a safe work environment. Kudos for Try the World for including this in the box. My least favorite part of the box, sardines! ewwww. A good Caesar salad dressing is just not complete without them, and that's the only way I plan on using these. 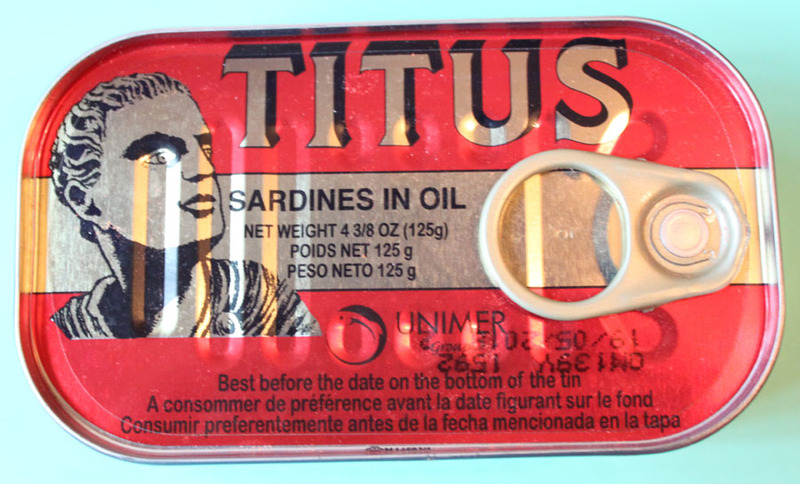 Sardines are a staple in Moroccan cuisine and an excellent source of protein, vitamin D, and vitamin B12. Still...not one I'll be consuming straight from the can. 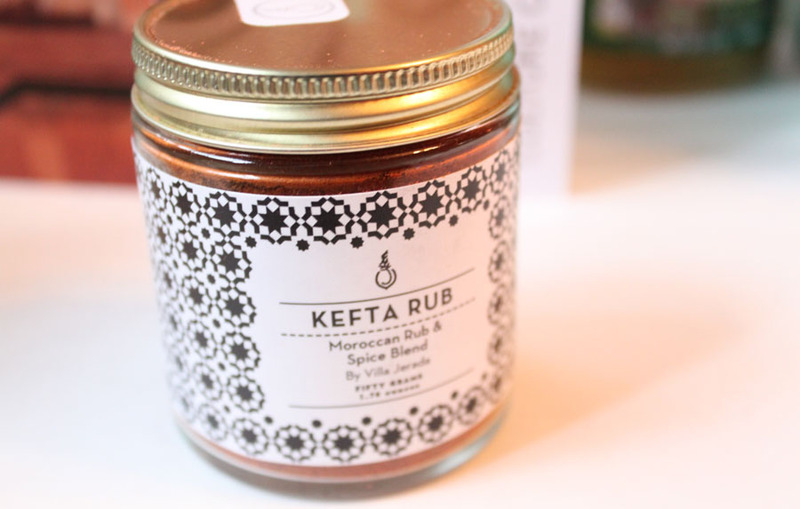 Kefta is a robust rub that can be used on beef, lamb, or chicken. Villa Jerada is sure to become a must-have in your culinary repertoire for kebabs, tagines, and more. This is a spicy rub that I know we'll get a lot of use of this Summer once it becomes BBQ weather. Spices are some of my favorites to get in boxes. 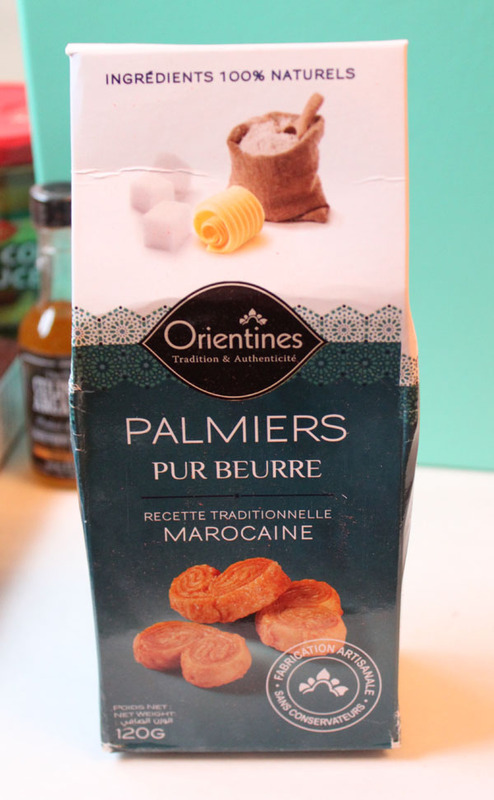 Orientines' fabulous snack pastries are a blend of Moroccan tradition and innovation that makes an entirely authentic cookies. Their selection of unique flavors are made using only natural ingredients. "Palmiers Pur Beurre" is a classic buttery cookie. Very tasty with coffee or Moroccan mint tea. 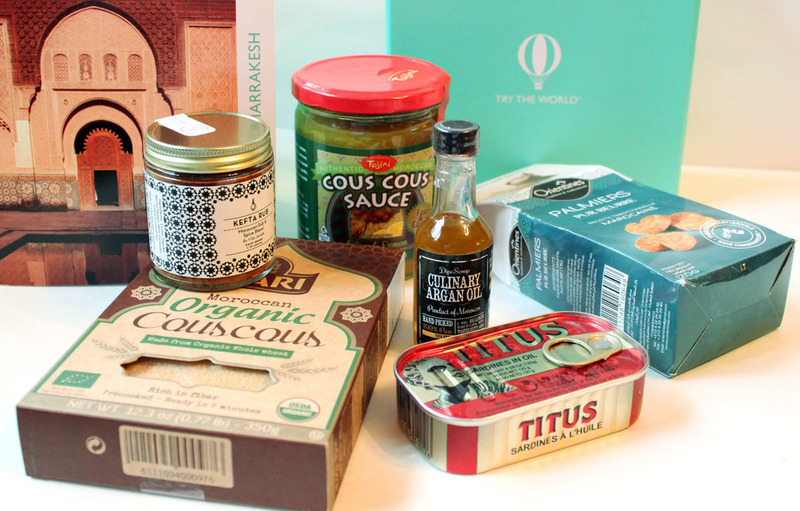 While I didn't love this box as much as the Paris Box, Marrakesh was still a treat to sort through and discover foods that I've never tried before. I also liked how a lot of the items put in here were supporting small farmers and brands. Being that so many of the products in here were healthy was a plus too. Not all the boxes are the same so you might get different choices than I got here...maybe you won't get the sardines ;) The new box is South America which looks fantastic! Get BOTH boxes for the price of one right now and at 30% off (used code MONROETRAVELS at checkout)! Sign Up HERE!